One type of restaurant that is very unique to Nashville is the Meat & Three. This concept makes so much sense that I always get taken back when an out-of-towner visits and asks what a Meat & Three is. It is simply one meat and three sides. 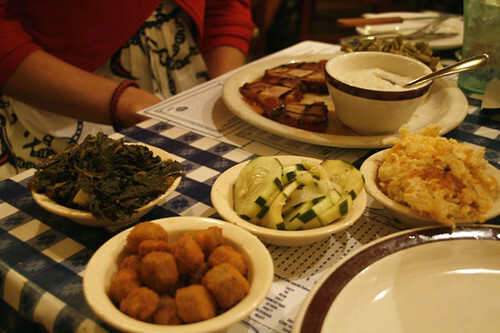 Restaurants will have Southern, country cooking and usually have a selection of a few meats and a larger selection of vegetables or other sides and you can pick and choose. For example, fried chicken with green beans, macaroni and cheese, and greens. That’s one of my favorites! Well, every time Dolan and Ali Marie visit, we try to take them out for a Southern food fix and often find ourselves at one of these Meat & Threes. Dolan and Grant love their meat. Ali Marie and I love those sides and always have a hard time narrowing it down. Often we will just get three or four sides and skip the meat option. One visit, we ate at the Loveless Cafe and it occurred to us that if we both got four different sides, we could share and then each get to taste eight sides! Genius, or so we thought. 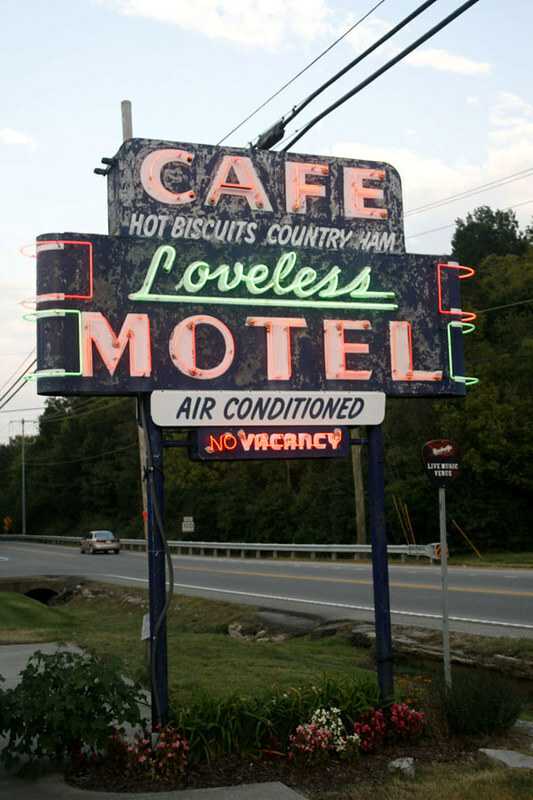 One of the Loveless Cafe’s speciality sides is Hashbrown Casserole. It is super decadent. I was reminded of it last week as we were asked to eat at friends’ house and they served their version. It was delicious. I kept thinking about it for days and decided to make a different, slightly healthier version, incorporating celeriac which I had just purchased. Celeriac is a strange looking vegetable. 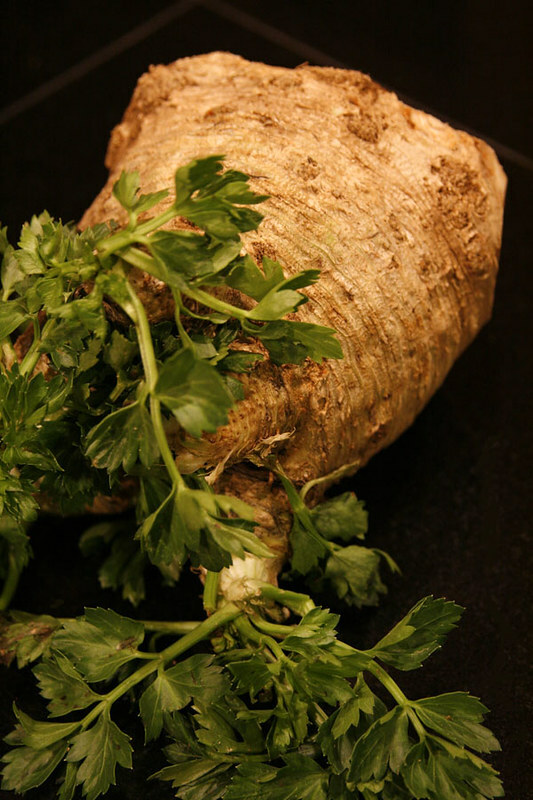 It is a special variety of celery which has a taste similar to a combination of celery and parsley with a slight smoky flavor. It is known for its diuretic qualities and can be useful for kidney stones and arthritic conditions. It has also been known to benefit the lymphatic, nervous, and urinary systems of the body. I found some beautiful golden beets this week, too, so to accompany the casserole, I made these Beets with Currant Vinaigrette. 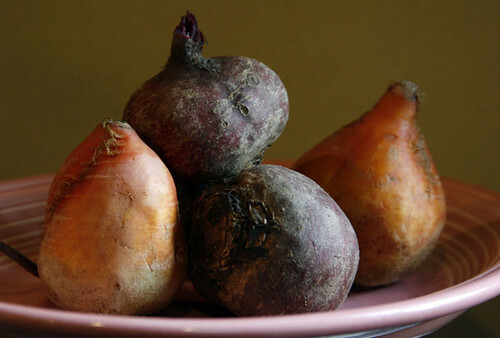 Steam the beets in a steamer on the stove. Once they are tender, remove from heat and let cool. Once you can handle them, slice them in thin rounds and arrange on a plate. Add all of the next ingredients except the water to a blender or food processor. (I use a little mini food processor that works perfectly for making dressings.) Blend or grind until thoroughly mixed. Place the vinaigrette in a small sauce pan on the stove on low heat. Add water, 1 tsp at a time to thin out. 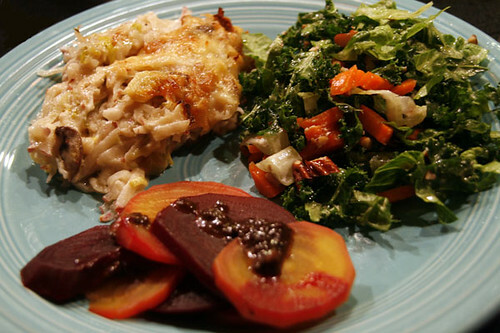 Pour vinaigrette over the beets. 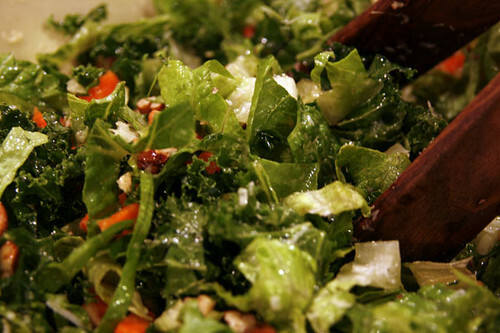 We’ve been on a big kale kick lately, too, so to complete our veggie plate last week, I made this easy and delicious Kale Salad. 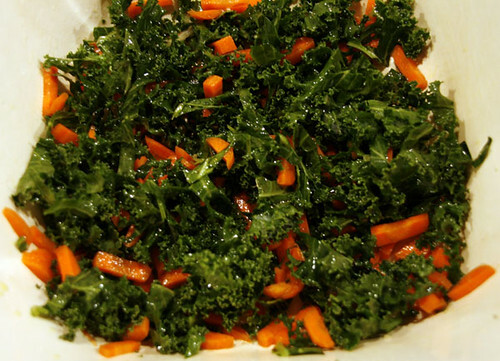 Chop the kale in small strips and place in a bowl with the carrots. Squeeze the lemon over top and add a little salt and olive oil. Massage the ingredients together with your hands. This helps slightly wilt the kale and take some of the bitterness out. Let sit for a few minutes. Cut the romaine into thin strips and mix in. Add the pecans and cheese. Add a little more olive oil and mix together. And here’s what the veggie plate looked like all together! It was all so tasty, we didn’t miss the meat, although, any of these dishes would be a great accompaniment to any of your favorite meat dishes. Another common menu item down here in Nashville is Chess Pie. Apparently, Chess Pie came from England originally, and was found in New England as well as Virginia. Recipes vary, but are generally made up of a filling composed with eggs, butter, sugar and vanilla. What sets this pie apart from other custard pies is the addition of corn meal. Our friend Mark just had a birthday and he requested a Chess Pie. I’ve always wanted to figure out how to make one so this was a perfect opportunity. I looked through many different variations online and my cookbooks. There are so many variations but this is the simplest one I found, which is what I wanted for my first one. Chess Pie is pretty sweet and the batter is sort of cake batter-like. 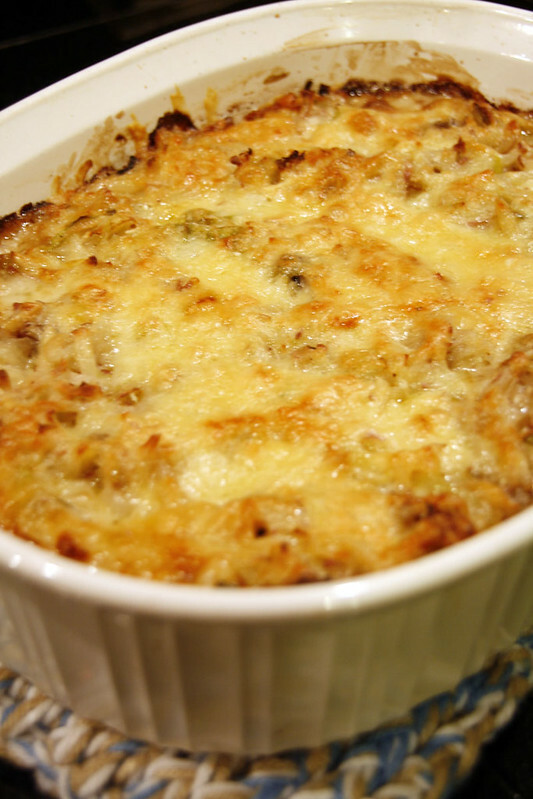 I can’t wait to make it again and add toasted coconut flakes! Cream the butter and sugar, add then eggs one at a time. Add vinegar, vanilla and the cornmeal. Stir gently and then pour in unbaked pie shell, homemade of course. Bake at 325 for 45 minutes. I’ll close with this photo of our beautiful friend, Julie Lee. 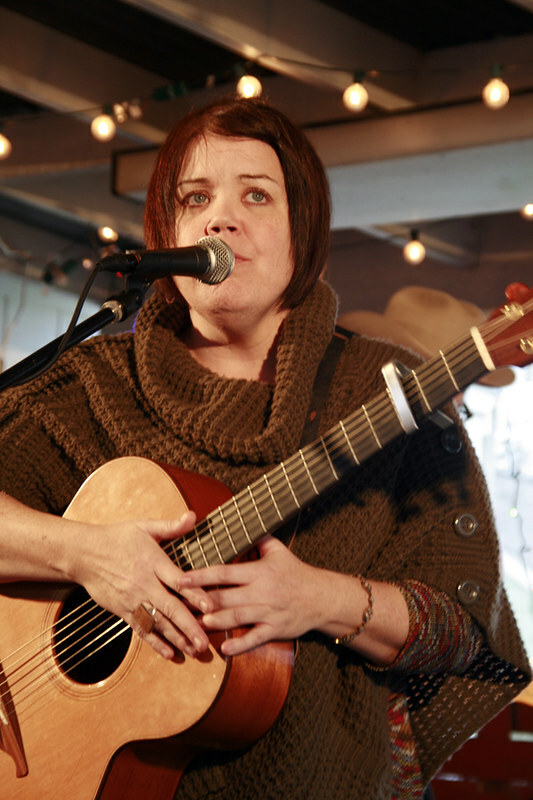 Julie is a fabulous Nashville songwriter who has an awesome brand new album out titled, Julie Lee & The Baby Daddies. You can purchase her new cd here. Not only is Julie Lee a great songwriter and talented singer, she also creates some amazing art made from vintage and recycled materials. Check out her art here. Here’s a promo video she recently made for this new cd.